There will also be a Friday Night IPA 5K on April 26 at 7 p.m. The Wildwoods, NJ – Delmo Sports and the MudHen Brewing Co. in Wildwood have teamed up to present the MudHen Half Marathon, 8K & 5K – formerly known as the Wild Half Race Series – taking place along the Wildwoods coastline, Friday, April 26 through Sunday, April 28. On the evening of Friday, April 26, the IPA 5K will begin at 7 PM. The race starts and finishes in front of the MudHen Brewing Co., located at 127 W. Rio Grande Avenue in Wildwood. On Saturday, April 27, the 8K race will begin at 9:30 a.m. outside the Wildwoods Convention Center at 4501 Boardwalk. Also on Saturday, children 12 and under are invited to get fit and participate in their first “marathon.” Beginning at noon, the Mini Mudhen Kids’ Race starts and finishes on the boardwalk outside the Wildwoods Convention Center. All children receive a complimentary pier pass to Morey’s Piers and Water Parks. 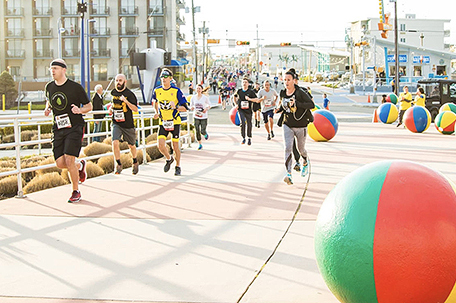 Courses will feature live music, well-stocked aid stations and a finish line celebration in front of the Wildwoods Convention Center. The Half Marathon will begin at 7:30 a.m. followed by an awards ceremony at Fox Park in Wildwood and an after party at the MudHen Brewing Co. featuring live music, food and craft beer. All race events are rain or shine. For additional information, to register, or to view the full schedule of events for the weekend, visit http://www.delmosports.com or call 609-849-8908.